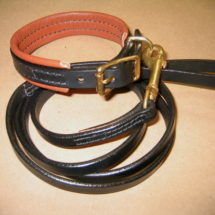 All Hand made of only the Finest English Bridle Leathers, all widths and lengths available. I cut only from the “Backs” of hides where the most strength is. We carefully pay attention to assembling each piece for strength and durability. 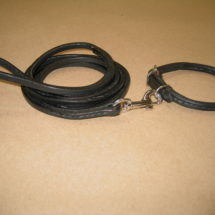 All our lines have contoured and Stitched closures with Finished edges. Twist Braided ends are secured by Solid Brass Studs. No Skimping! on the Hardwares, I use only Top Quality Solid Brass,Chrome over Brass and Stainless Steel. 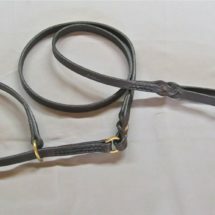 Nothing matches the Feel and Endurance of these Bridle Leathers. 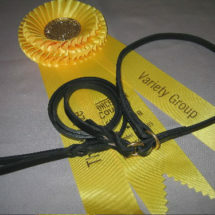 Entertain the Classic Bridle Colors of London Tan, Havana Brown, Black and our Custom “Red”! 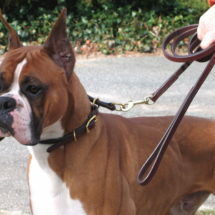 For all Dog Breeds from Training to Show. This is the Leather you’ve been looking for.